Record participation for the 27th Spring Trophy at the South Garda Karting circuit of Lonato: 293 drives on track in 11 categories. The winners: Dante (KZ2), Antonelli (Entry Level), Enders (60 Mini), Cesari (Prodriver Under), Scagnelli (Over), Micheletti (Club), Scarfò (Mini Rok), Guidetti (Junior), Trombelli (Senior), Cinti (Super) and Zani (Shifter). 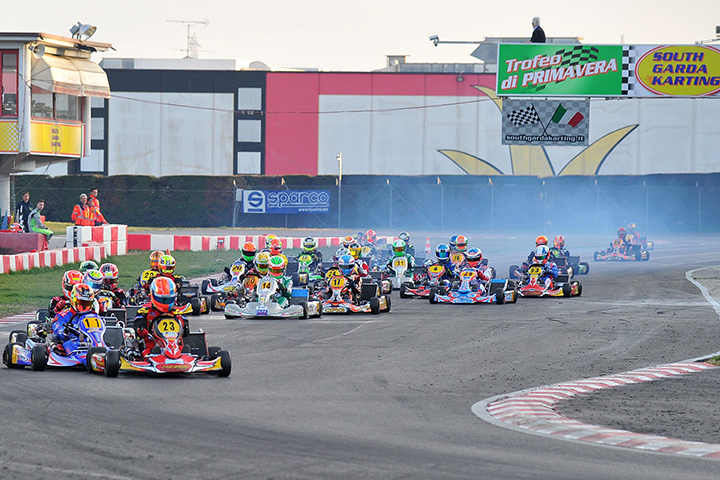 Only a handful of entrants were missing to reach the round number of 300 drivers in this season opening at the South Garda Karting track of Lonato (Brescia, Italy). In the end, a total of 293 drivers have been verified out of the 298 entered in the 11 categories on track in the 27th edition of the Spring Trophy held on March 20th. The race had also validity for the Regional Championship Lombardia and for the Rok Cup Area North. The 27th Spring Trophy set a new presence record for 2016, not only for the circuit of Lonato, but also for the whole Italy. Such a result has been fostered by several factors, such as the organization of the more and more effective South Garda Karting Circuit, the new layout of the track now extended to 1.200 meters, the new impressive paddock of 23.000 square meters, the communication services featuring Live Timing and Live Streaming for all the races, the coverage of the circuit with 20 CCTV cameras for a capillary monitoring of races, and some other important services that launched the circuit of Lonato to the Olympus of International Karting. A total of 98 drivers have been competing for the Regional Championship Lombardia, and 195 for the Rok Cup Area North. These are important numbers and, particularly the Rok Cup, underlines the growth of the single branded championship by Vortex. Massimo Dante, on Maranello-Tm, has been again the “King” of Lonato in the most powerful category on track, KZ2. He dominated the three Trophies held last year in Lonato: the Spring Trophy, the Summer Trophy and the Autumn Trophy. Category KZ2, had 33 drivers at the start. Dante, after winning the Prefinal, crossed the finish line of the Final ahead of Enrico Bernardotto on CKR-Tm and Nicola Gnudi on VRK-Tm. The other top positions went to the Austrian Christoph Hod on Maranello-Modena, who was fourth as P5 was obtained by Luciano Medeghini (VRK-Tm) who inherited the place of Danilo Albanese (Tony Kart-Tm) due to a penalty. Alessandro Buran was sixth on Olikart Haase-Maxter. The top ten was rounded up by the Swedish driver Brandon Nilsson (Righetti Ridolfi-Vortex), Luigi Del Vecchio (Tony Kart-Vortex), Marco Pastacaldi (Tony Kart-Tm) and Mirko Colombo (Energy-Tm). The smallest of the categories, namely, Entry Level, reserved to kids aged between 6 and 8, had 7 drivers on track. Here, Alessandro Antonelli (Top Kart-Lke) managed to win the Final from Giacomo Pedrini (PCR-Lke) to Riccardo Ferrari (Croc-Iame), who won the Prefinal. Category 60 Mini, with 5 drivers on track, saw the German Paul Enders (CRG-Iame) having the upper hand both in Prefinal and in Final, leading Mattia Vischi (Intrepid-Tm) and the Austrian Lukas Zbul (Maranello-Lke). In Prodriver Under (27 drivers at the start), Francesco Alfiniti (CKR-Modena) won the Prefinal, but the victory of the Final went to Roberto Cesari (Maranello-Tm), as Rodolfo Massaro (Energy-Tm) was second and Lorenzo Natali (CRG-Tm) third. In Prodriver Over (16 drivers), Paolo Scagnelli (Energy-Tm) took the win from Andrea Tonoli (CRG-Tm), who had won the Prefinal. The third place went Gionata De Mezza's ways (Tony Kart-Tm). In 125 Club (10 drivers), Davide Micheletti (Maranello-Maxter) claimed the victory in the Final after winning the Prefinal. The second place went to Maurizio Giberti, who was followed by Marco Miastkowski, both on VRK-Tm. 195 DRIVERS ON TRACK IN ROK CUP. THE WINNERS. The most crowed category was Mini Rok, that featured 63 drivers at the start. The Polish driver Piotr Protasiewicz (BirelArt) was on top after the three heats, but the Final was won by Alessio Scarfò (Tony Kart), who was third after heats, as Nicola Placa (Energy) was second and Edoardo Ludovico Villa (Tony Kart) completed the podium. In Junior Rok (44 drivers), Jacopo Guidetti (Evokart) has been victorious both in the heats and in the Final, where he eventually proceeded Samuel Luyet and Davide Cordera, both on Tony Kart. In Senior Rok (42 drivers), among the three main protagonists after heats, Daniele Barbero, Michael Muller and Alessandro Trombelli, all on Tony Kart, Trombelli managed to end his effort winning the Final from the Polish driver Szymon Szyszko (Kosmic) to Riccardo Florindo (Tony Kart). In Super Rok (21 drivers), Riccardo Cinti managed to have the best of Simone Mazzotti in the Final, as the latter secured the win in the Prefinal. The third place went to Vittorio Maria Russo. These three drivers were all racing on Tony Kart. In Rok Shifter (25 drivers), Cristopher Zani (DR) claimed the victory of Prefinal and Final. In the latter case, he crossed the finish line ahead of Marco Pagani (Tony Kart), while Mattia Melis (Maranello) inherited the third place from Gabriele Bensi (DR), who had been handed a 10s penalty due to the incorrect positioning of the front fairing.